Aqua’s Flow vape juice is now available with a nicotine salt formula! Flow is an exotic blend of juicy pineapple, mango and guava that’s perfect for refreshment on the go. Aqua Salts’ Flow is great for fruit vapers looking for a unique blend for their mouth-to-lung device. Aqua Salts juices use nicotine salts in place of freebase nicotine for a powerful nic hit with no unwanted harshness when vaped. 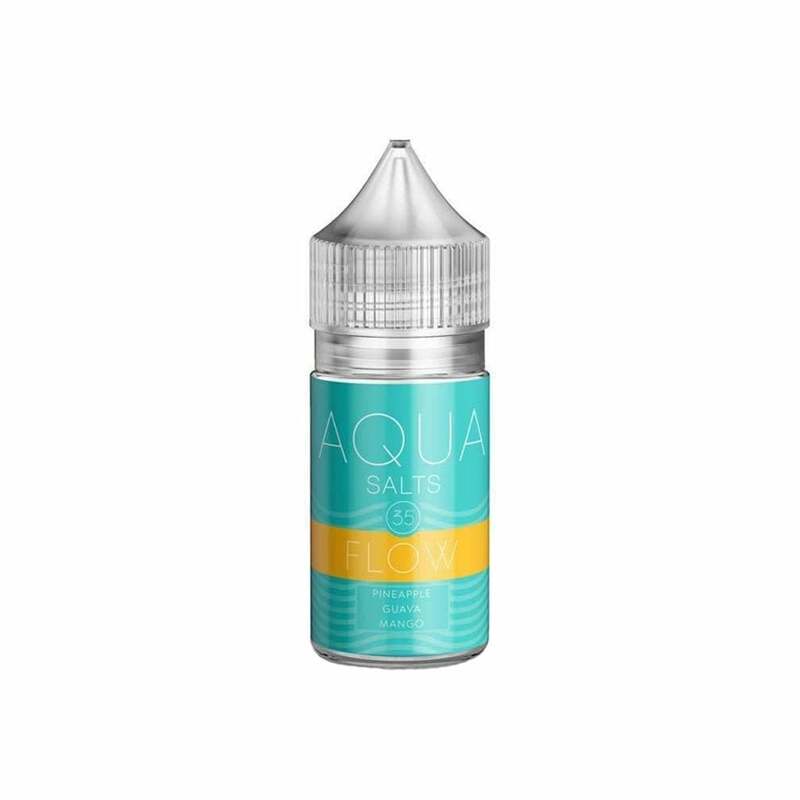 Aqua Salts vape juice is made with nicotine salts for a smooth inhale and quick nic rush. Juices from Aqua’s nicotine salt range have a 50% PG, 50% VG formula and are available in 35mg (3.5%) or 50mg (5%) nicotine. Each Aqua Salts bottle is 30ml. Great tropical juice for that sweet tooth. A tad refreshing and hits like a champ. Best mango like flavor i've had. Very good flavor mostly pineapple flavor a bit lighter on the other 2 but still tasted really nice I mix a little bit with other e-liquid in a sub-ohm setup to give an extra hit, works great tastes great definitely recommend. So so, makes me sick personally. The company makes other juices and they come in a good size along with a dropper that is small enough to not need a needle nose bottle but in this case, the flavor specifically isn't good in my opinion. Absolutely love this product! Great flavor & never spits! I use this juice for the Boulder & it’s an easy fill, plus it lasts me a while before the pod runs out! I love this brand! !